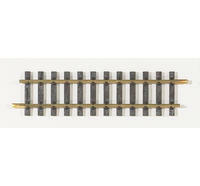 • Code 332 (0.332" high) solid rails of pure, virgin brass for excellent electrical conductivity. • Ties of ultra-violet stabilized HDPE (high-density polyethylene) for decades of use outdoors. • Unique track geometry makes even complex track plans simple to build with only a few types of track sections.